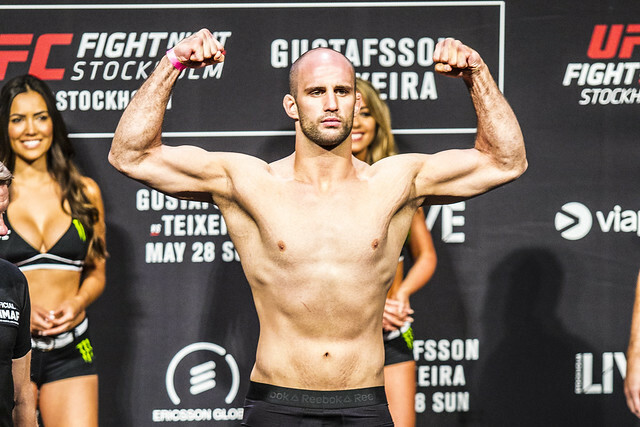 Volkan Oezdemir fights for the UFC Light Heavyweight Championship of the World tonight in Boston, Massachusetts. The “Eidgenosse” will write history as he will become the first-ever fighter from Central Europe to challenge for a UFC title. As with most top European fighters who started competing in MMA during the last fifteen years, I have seen Volkan’s career unfold before my very eyes and being from the same “scene” here in German-speaking Europe (although Volkan is from the French-speaking part of Switzerland), naturally there have been some intersections. Funnily enough, it was me who matched him for his very first MMA fight. My good friend Martin Vath, who was ranked Top 5 at light heavyweight in Germany at the time having already competed a couple of times and coming from a Combat Sambo background, proved to be no match for Volkan’s raw power and succumbed to strikes a little less than a minute into the fight. I saw Volkan compete two more times on the Swiss circuit. In 2012 and 2014, he put on his gloves for the formidable SHC: Strength & Honor Championship event series of my good friend Raid Salah. Neither of his opponents lasted more than two minutes. You could see that even back then, Volkan clearly had “No Time”. When I became in charge of matchmaking for the European Fighting Challenge in spring of 2016, I tried my damn hardest to bring Volkan in and make him one of the cornerstones of our heavyweight division. He eventually decided for Titan FC, because they were on UFC Fight Pass and despite never competing for them, he got picked up by the UFC in early 2017. His rise through the ranks of the UFC light heavyweight division has been absolutely meteoric and a good reminder that despite all the talks of “money fights” and meaningless rankings, you can still earn your way to a title shot the old-fashioned way: By obliterating everybody in front of you as quick and devastating as possible. After the win over OSP, everybody claimed it was a fluke and having lost 3 out of his last 4, St. Preux was deemed no top-level fighter anyway. I had the pleasure of watching his fight with Misha Cirkunov live and I was very impressed with the way he dealt with him, especially after seeing Misha whoop my fighter Nikita Krylov just half a year earlier. Another devastating knockout over Jimi Manuwa followed and here he is, challenging Daniel Cormier for the title. The champion wants to shrug off Volkan’s title challenge, claiming he’s out of his depth, but how can you deny somebody his opportunity who has beaten three of the most feared fighters in the UFC light heavyweight division in a little more than half a year? He might be the 5/2 underdog with the bookmakers tonight, but I’m sure all martial arts fans in Europe will sit glued to their screens tonight, rooting for this Cinderella Story to find a happy ending. I certainly will. Bonne chance, Volkan!